What's the address of the place you are moving to (including zipcode)? TIP: You can enter a specific address or just the city, state (or even zipcode). We will have a sales associate reach out to you very shortly so we can give you an estimate that is as accurate as possible. Usually, people have plenty of time to plan a move, but what if you get your dream job offer and must start work in a different city or state on short notice? Or what if you’ve been planning to relocate, but you sell your house much sooner than expected? You also might find the need move quickly to care for an elderly parent who has fallen ill. 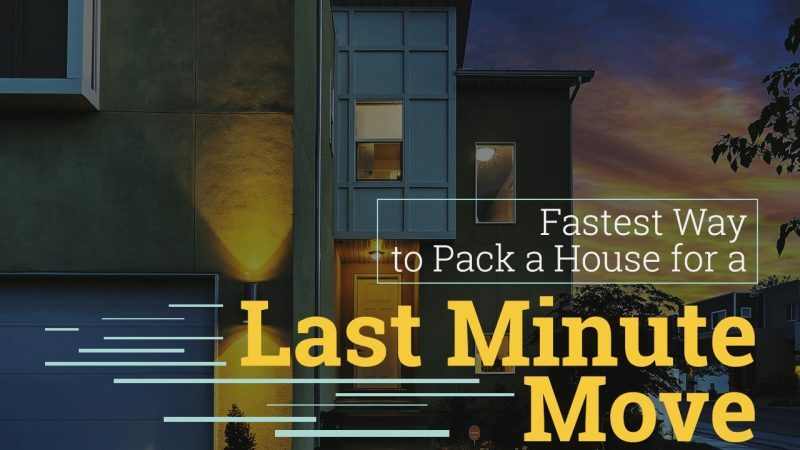 There are all sorts of reasons you might have to make a last-minute move. If you find yourself needing to move suddenly, you might feel overwhelmed and crunched for time. You’re probably wondering how you can pack your entire house with little notice. Here are some useful ideas that will help you to pack up your home or apartment quickly for a last-minute move. Organizers always advise that you purge unwanted or unneeded items before a move. This decluttering will enable you to pack up what remains much more quickly than if you try to move everything you own. Unfortunately, you probably don’t have time to organize, advertise, and hold a garage sale. So, what’s the quickest way to get rid of the stuff you don’t need? Donate your unwanted items. You might not have time to schedule a donation pick-up, but you can easily and quickly drop off unwanted clothing and other household items at a donation collection center like the Salvation Army or Goodwill. Make sure to take a receipt so that you can deduct your donation from your taxes. Donate your canned food to a local food pantry. Check Feeding America to find your nearest food bank. Give stuff away to your neighbors. This strategy is a great way to get rid of partially used cleaning supplies, oil, gasoline, insecticides, fertilizers, and other things that you would otherwise have to spend time disposing of properly. Toss or recycle unusable items. If you have things that are broken or unusable or badly worn, gather them all together and make a speedy trip to your local dump to toss them. Sort through your books. With more ready access to free and cheap e-books, it might be time to pare down your book collection. Collect all the ones you don’t want and take them to a local used bookstore, like Half Price Books. You’ll only get a little bit of cash, but you’ll save a lot of space in your moving truck, and you won’t have to spend time carefully packing them. What books the store can’t use, it will likely donate for you. Alternatively, you might be able to give your books to your local library. The Austin Public Library will gladly take old books off your hands. Give away bulky furniture. If you have large items you want to give away, like a couch you don’t need anymore, try listing it on the Freecycle Network or Craigslist. In your post, emphasize that you need the item picked up within 24 hours. 2. Pack an “essentials” box or bag. An “essentials” box will prevent you from losing essential things in the hurried frenzy that will accompany your move. It will also give you time to decompress in your new house before you are forced to start rummaging through boxes to unpack. It’s ideal to sort items before packing to make them easier to unpack in your new home. However, when it comes to a last-minute move, you may not have time for detailed organization. You need to concentrate on getting everything in a box. So, instead of sorting all your family’s shoes in one box, or all the toys in one box, just pack up each room as fast as you can and label the box by the room name – master bathroom, master bedroom, kid’s bedroom, etc. 4. Recruit a few friends to help you pack. This assembly-line approach may also help you to keep your workspace freer and cleaner, which could help the packing to go faster. 5. Keep clothes in your dressers. Instead of removing and packing the clothes that are already in your dresser drawers, leave them. Either seal the dresser drawers closed and in place for moving or take them out and wrap them with movers’ wrap. This step will save you time in assembling boxes, packing, and loading. 6. Use linens for padding. Instead of packing your linens separately, consider using them as packing material. Pad the bottom of your moving boxes with sheets, blankets, towels, and other soft linens. This step will enable you to kill two birds with one stone – getting your linens packed and cushioning your other items. You can always throw in the towel and hire professional movers who will pack up everything for you. Apple Moving is available to serve your last minute moving needs and may even be able to provide same day moving service in Austin. Our expert crews know how to pack quickly and efficiently, so we can get you on the road to your next destination as soon as possible. Don’t stress about a last-minute move! With some fast decluttering and extra hands to help, you can tackle a short notice relocation with relative ease. Call Apple Moving for cheap rates on local and long distance moving! Known for our affordable moves and amazing professional staff, Apple Moving is changing the way you approach moving.